Graham is a friendly 2-year-old German Shepherd ready for adoption. Check him out at the Champaign County Animal Welfare League. Sammy and Silas are 8-month-old sisters eager to be adopted, separately or together, before Christmas. Pay them a call at the Champaign County Animal Welfare League. 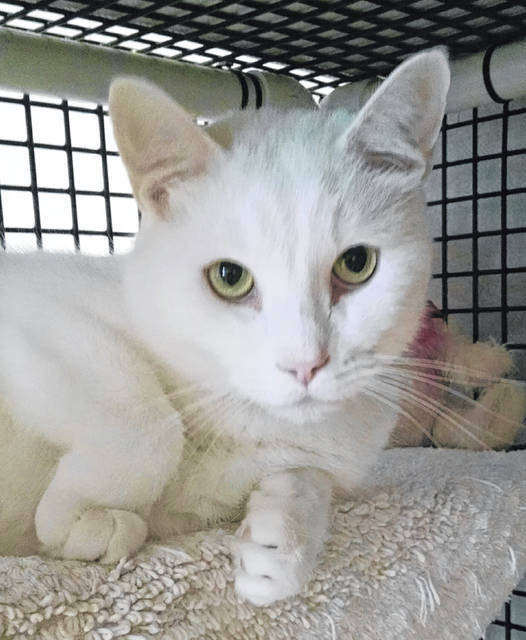 Olaf’s caretakers at PAWS Animal Shelter describe this 3-year-old as both affectionate and private and hope this describes someone’s perfect new companion. Four-year-old Riley would be a joy in a childless home, although a home with cats and other dogs would be fine. You can visit him at Barely Used Pets. Riley is quite the ham. He will sit and beg for a treat. Riley is a 4-year-old Jack Russell Terrier. He is good with other dogs and cats and appears to be house trained. He walks well on a leash. He needs to be in a home with no young children. He is up to date on shots and is scheduled to be neutered. Riley’s adoption fee is $150. Olaf is this week’s Pet of the Week. Olaf is a 3-year-old domestic short-hair neutered male. He is pure white and just as handsome as can be. He is affectionate and very private at the same time. He will do best in a home with no children or with children who are older because of this. He is mature and gets along with most of the other cats. Olaf likes to lounge and watch out the window. He will go home up to date on his vaccinations and would love for you to come visit him at the shelter today. – Shelter Open House on Saturday, Nov. 17, from 1 to 3 p.m. 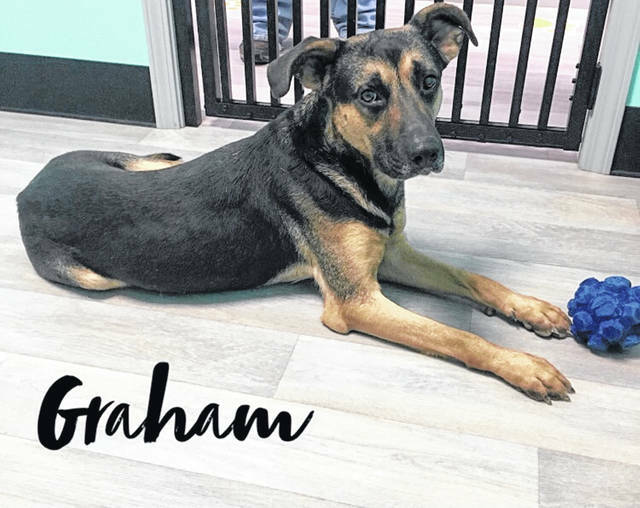 The Champaign County Animal Welfare League (CCAWL) pet of the week is Graham, a 2-year-old German Shepherd mix weighing about 50 pounds. Graham came to us as an unclaimed stray. He is very loving, sweet and has a good temperament. Graham is good with other dogs, but will require a meet and greet like all other adoptions. He hasn’t been cat tested and will be if needed. Graham appears to be house trained, but if not, he won’t take long to learn. He is neutered, microchipped, current on vaccinations: BivalentFlu, Bordetella, Da2PPL and Rabies. Graham has also been heartworm tested negative, dewormed and is on flea, tick, and heartworm prevention. If you would like to give Graham his forever home just in time for the holidays, please fill out an application, which can be found on our website www.champaigncoanimalwelfareleague.com or come to our facility during business hours for an application. The Champaign County Animal Welfare League (CCAWL) would like to introduce Sammy & Silas, domestic short hair, 8-month-old sisters who have been with us since they were 7 weeks old. They are not a bonded pair but would like to find their forever homes before the holidays. They are loving, playful and would like daily pets from their humans. They are litter trained, spayed, current on all vaccinations, FCRPP and Rabies. They have been FeLV/FIV tested negative and current on flea prevention. If you think you would be interested in making either a part of your family, please stop by our facility during business hours to fill out an application. https://www.urbanacitizen.com/wp-content/uploads/sites/36/2018/11/web1_LeagueDog-2.jpegGraham is a friendly 2-year-old German Shepherd ready for adoption. Check him out at the Champaign County Animal Welfare League. 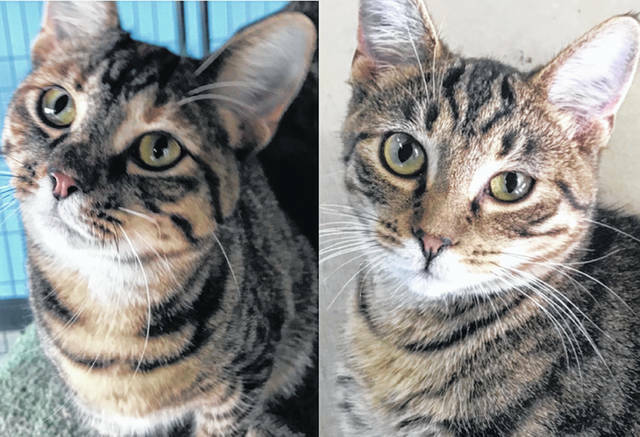 https://www.urbanacitizen.com/wp-content/uploads/sites/36/2018/11/web1_LeagueCat-2.jpegSammy and Silas are 8-month-old sisters eager to be adopted, separately or together, before Christmas. Pay them a call at the Champaign County Animal Welfare League. https://www.urbanacitizen.com/wp-content/uploads/sites/36/2018/11/web1_PawsCat-2.jpgOlaf’s caretakers at PAWS Animal Shelter describe this 3-year-old as both affectionate and private and hope this describes someone’s perfect new companion. https://www.urbanacitizen.com/wp-content/uploads/sites/36/2018/11/web1_BarelyDog.jpegFour-year-old Riley would be a joy in a childless home, although a home with cats and other dogs would be fine. You can visit him at Barely Used Pets.